Orlandoans love, love, love a good cup of coffee. Coffee has become an important topic in The City Beautiful, and I’m personally just discovering the caffeine buzz. Now I’m no coffee connoisseur, but I certainly enjoy things that are made with quality. Stores in town are not only serving quality coffee but are providing great atmosphere as well. Let’s talk about how the atmosphere at several coffee shops has customers returning for more. Orlandoans can choose from a range of experiences and shops that offer a great atmosphere in the Downtown Orlando area. You can sip coffee and shop goods at Craft & Common, get lost in the mosaic art at Lineage, and keep things low-key at Deeply. Let’s examine how these coffee shops offer a great atmosphere and how that has customers returning through their doors. With its unified stone counters, wooden tacked walls, and a distinct quiet room, walking into Deeply Coffee feels like a hip & modern coffee experience. Deeply is tucked away near Lake Eola, and they focus on offering high quality coffee in an inviting environment. My first visit was exciting because I’ve never seen a coffee shop like this before in Orlando. Their appreciation for raw materials is visually displayed in their store and throughout their coffee buying experience. From the smooth wood accents of their furniture, to the metal and glass that encases Deeply, these elements truly display that they care about a naturally attractive aesthetic. 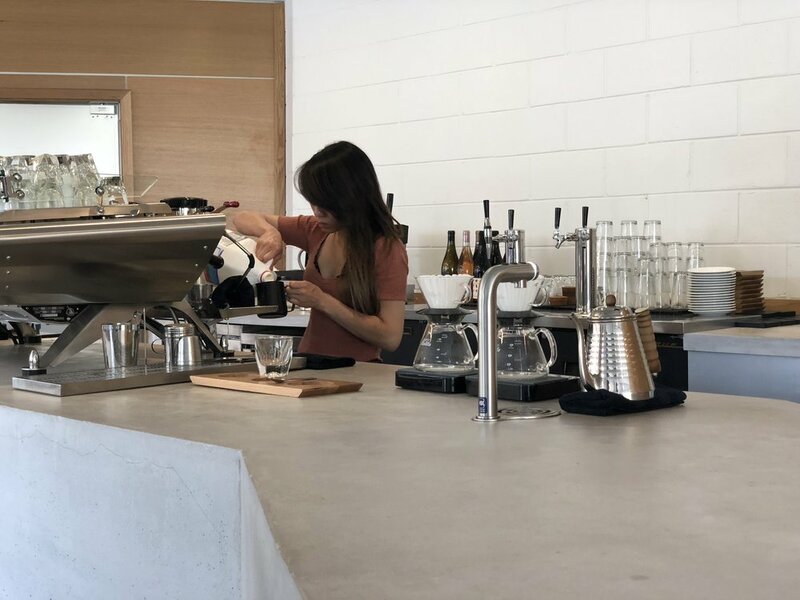 Their stone bar brings you closer to the baristas - allowing you to appreciate the coffee making process and the essence of what they do best: make good coffee. Their atmosphere is so cool that I couldn’t help but ask the baristas about Deeply and their coffee roasting experience. Deeply communicates to the coffee scene so well because they provide the pieces that coffee lovers enjoy - a quiet setting, a knowledgeable staff, and a quality product. The combination of these factors has fans, like myself, sharing the experience and returning again. Lineage is located on Mills 50 and is one of the popular nooks in town. This cozy establishment, is highly focused on discovering the nuances, heritage and culture behind roasting their coffee beans. The owners are so dedicated to this mission, that they traveled across parts of Africa, Central America, and South America to learn the delicate coffee growing process. All that energy spent on truly learning how coffee is produced, was brought back to Orlando to provide a new coffee experience. Upon walking in to Lineage, you are hit with a rush of unfamiliar scents and sounds. The nook-like aesthetic is complimented by wood accented shelving and low hanging plants. Most of the atmosphere feels boutique-like: tight but big enough to host a small event. The shiny marble floor, simple retail shelving, and low level wooden tables, allows for a new visitor to feel comfortable in their own space. Aside from their coffee, Lineage has put thought into crafting an inviting corner-shop for anyone to take comfort in. Tucked away on the corner of Robinson St & Orange Ave, Craft & Common is a new shop that has a unique approach to coffee. Not only do they sell coffee, they sell a lot of other products from local Orlando businesses, such as Corkcicle, Land Of Alice, and Porch Pottery. With its large windows that go from the ceiling to the floor, clean white walls, and living plants that are showcased all around, Craft & Commons’ atmosphere is open. Walking in feels very freeing and welcomes a refreshing take, unlike the usual cramped chain coffee shops. With their warm Wild Child lattes, and their lounging area, where you can take photos for Instagram, Craft & Common captures an atmosphere that is intimate. Craft & Common has kept patrons returning and has defined its spot in the local coffee scene. When you come for coffee, you will leave with a great time! A lot of my personal experiences at these shops were defined by the memories that I left with. I shared these atmospheres because I valued how much they added to my experience. That’s the important take away from this. There was more to discover at these shops then just coffee. If you’re an avid coffee drinker, you can appreciate the nuances described in the shops above. If you’re a small business owner, consider the effect your atmosphere can make for your customers experience. If you’re new to Orlando’s coffee scene, I invite you to explore the variety of coffee shops in The City Beautiful! Help yourself to a big cup of Joe and visit these shops and many more in the Orlando coffee scene. Let us know your favorite coffee spots in the comments below!